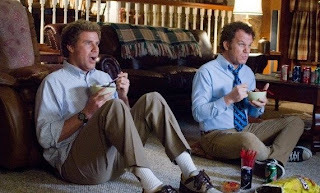 Whopper's Bunker: Step Brothers: I was almost sick at the end. Will Ferrell and John C. Reilly's last comedic team up was Talladega Nights: The Ballad of Ricky Bobby. It was a brilliant comedy when compared with most of the other comedies out there but not near the quality of the greatest comedy move of all time Anchorman: The Legend of Ron Burgundy. Ferrell made another comedy hit with Jon Heder called Blades of Glory, this was superior to Talladega Nights but not close to Anchorman. Tonight I saw the best movie Ferrell has done since Anchorman, the bizarrely hilarious Step Brothers. The plot is simple, as it should be for a comedy such as this- Mary Steenburgen and the excellent Richard Jenkins play Nancy Huff and Dr. Robert Doback who quickly meet and get married. Naturally Nancy moves in with Robert and brings her son Brennan to live with Robert and his own son Dale. The bizarre angle here is that Brennan and Dale are played by Ferrell and Reilly, two 40-year-old lazy jobless morons, and from there - the hilarity ensues. From the early moment when I observed Ferrell putting his hand down his pants to fondle himself while watching an aerobics instructor on the TV, I was worried in case that the movie was going to go from one puerile toilet-joke to another , filled with the adolescent humour that I suppose wouldn't be out of place considering Ferrell and Reilly were playing two grown men who just never grew up, but it wasn't. It was bright and refreshing comedy (with only some sporadic and indeed well placed toilet humour). I don't want to ruin a single gag for anyone. Although they are plenty of them, each is a gem in it's own right and my simple words wouldn't do them justice as it's a very visual movie. I will say it's unfortunate that you have to wait until the credits start rolling to get the biggest laugh of the whole movie, a completely unexpected battle scene where our two "heroes" take on a mighty army that once defeated them. Before it was over, I had stuffed the cuff of my jacket into my mouth to prevent my screams of laughter from someone thinking I was in agony. In truth, I was - the agony of laughter, I thought I was going to be sick. Yeah that Ang Lee scene at the end had me in stitches. You disrespect the Woo, you disrespect me. Semi Pro was dissapointing as well, but again, it too is better than some of the suff that gets greenlit as comedy. I think Ferrell's doing too much, he's working on something else besides Anchorman 2 now I think.